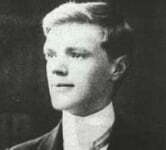 According to Wikipedia: "David Herbert Richards Lawrence (11 September 1885 2 March 1930) was an English author, poet, playwright, essayist and literary critic. His collected works represent an extended reflection upon the dehumanising effects of modernity and industrialisation. In them, Lawrence confronts issues relating to emotional health and vitality, spontaneity, human sexuality and instinct."